Traveling from her rural homestead in Montana to pick up her nearly 100-year-old mother from her senior residence on Chicago's North Side and bring her to the family's beach house on a dune overlooking Lake Michigan, Smith often gets lost in memory and rambling contemplation. Bruno's constant companionship and ever present needs force her to return to the actual, reminding her that she, too, is an animal whose existence depends on being alert to the scents, sights, hungers, and emotions of the moment. Passing through wide open spaces, dying ranch towns, green cornfields, and Midwestern hamlets, Annick is immersed in memories of her immigrant Hungarian Jewish family, her childhood days in Chicago, her early marriage, and ultimate immigration west. Triggered by random encounters along the way, she's taken back to life as a young mother, her career as a writer and filmmaker who produced the classic A River Runs Through It, the death of her husband, and the thrill of a late romance. A lifetime of reflection played out one mile at a time. 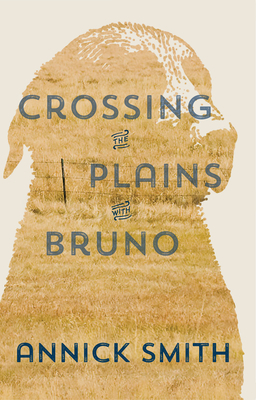 Crossing the Plains with Bruno is a story narrated by a woman beset by the processes of aging, living with the imminent reality of a parent's death, but it is the dog that rides shotgun, like Sancho Panza to Don Quixote, that becomes the reminder of the physical realities outside our own imaginations. Annick Smith is a writer and filmmaker of Jewish-Hungarian descent whose work deals primarily with the literature and history of Montana, memoir, travel, and environmental issues. She has worked as a high school teacher, a book editor for the University of Washington Press, and an editor for the Montana Business Quarterly. She is known for her film credits, which include Heartland, co-producer of Robert Redford's adaptation of Norman Maclean's A River Runs Through It, and associate producer of Peacock's War. Smith is a founding board member of the Sundance Film Institute and the founder of the Hellgate Writers, a literary center in Missoula. Her books include Homestead, Big Bluestem, and The Last Best Place, which she edited with William Kittredge. Her articles, poems, and stories have appeared in Audubon, Outside, National Geographic Traveler, Story, and elsewhere. She has lived in Montana since 1964.